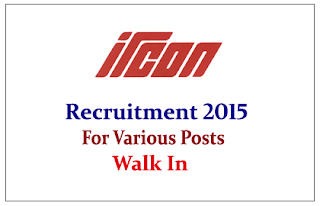 IRCON International Limited is recruiting for the post of Jr.Managers Senior manager and Other Posts. Interested and Eligible candidate can apply Online on or before 24th and 27th July 2015. Company Profile: Ircon International Limited (IRCON), a government company incorporated by the Central Government (Ministry of Railways) under the Companies Act, 1956 on 28th April, 1976 originally under the name Indian Railway Construction Company Limited, is the leading turnkey construction company in the public sector known for its quality, commitment and consistency in terms of Performance. How to Apply: Interested and eligible candidate should send filled application form to below mentioned address on or before 24.07.2015 and 28.07.2015. For more details kindly check official notification.